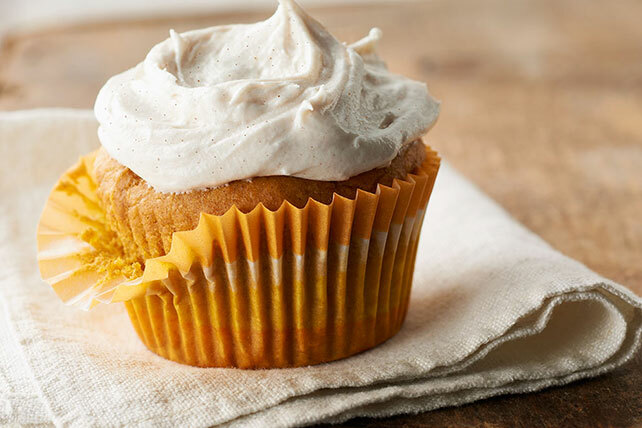 Bake up a batch of Pumpkin Cupcakes with Cinnamon-Cream Cheese Frosting for a taste of Fall! Pumpkin Cupcakes with Cinnamon-Cream Cheese Frosting are sure to be a hit at the dessert table! Beat first 5 ingredients with mixer until blended; spoon into 24 paper-lined muffin cups. Bake 20 to 22 min. or until toothpick inserted in centers comes out clean. Cool in pans 10 min. ; remove from pans to wire racks. Cool completely. Beat cream cheese, butter and vanilla in large bowl with mixer until blended. Gradually beat in sugar. Blend in cinnamon. Spread over cupcakes. Store frosted cupcakes in refrigerator.